When you think of the world’s most demanding racetrack, Germany’s Nürburgring, typically images of fire-spurting racecars and massive-winged Porsches loom into your consciousness; and rightfully so. But that fierce, twisting ring of tarmac where legends have been born over the last 80 years also served as the test bed for the Acura MDX. For 2009, not much changes with the MDX, and that’s fine with us. It remains a top pick for those with not only a need to move seven passengers but also the desire to attack local backroads when the opportunity presents itself. The combination of adjustable sport suspension and Acura’s SH-AWD system make the MDX a sporting drive, though the civilized, comfortable cabin is equally captivating. Boasting an advanced navigation system with real-time traffic, weather and routing information and features like a flip-down rear seat DVD player with wireless headphones, the MDX is apt to provide both driver and passenger with everything they need. The first two rows of seats are incredibly roomy, especially for a crossover SUV, and there seems to be a never-ending amount of storage nooks. The Acura Navigation System is simplistic in its efficiency, and the at-eye-level screen is easy to read. Due to the more sporty nature of the MDX, the ride can be a little bumpy. The power outlets have silly covers on them that could impede larger plugs, and the third row of seats can really only accommodate children. You would think that a crossover SUV's hefty weight would impact driving. You would, in this case, be wrong. The MDX has a surprising amount of pickup for a vehicle with three rows of seats, and competitors, like the base Volvo XC90, lack the horsepower that this car produces. Acura has definitely leaned toward the sportier setup, the suspension is a little hard for luxury driving, but around corners you'll love the sturdy and powerful feel from the Super Handling All-Wheel Drive System. Saying that, the drive quality is diminished slightly by the command position – you feel a bit like you're floating above everything and not as connected to the road as you'd like. Acura has upped the power in this second generation MDX. A 3.7-liter VTEC V-6 engine produces 300 horsepower and 275 lb-ft of torque. Its wide wheelbase, while less sporty than its RDX sibling, is almost as dynamic. The all-wheel drive system can transfer 100% of its power to the wheels that need it most, giving you a more secure ride. The transmission is a five-speed automatic with Sequential SportShift controlled at the shifter. There are an impressive number of standard features in this crossover. Off the bat you're given leather seats, an mp3 auxiliary jack, three months of XM Satellite Radio and Bluetooth interface. If you're feeling flush, we'd recommend the $3,500 technology package, which adds a navigation system with real time traffic and the ELS audio system – an aural dream. DVD entertainment is available in a few optional packages as well, and sport packages provide an active damper system and interior accents. The MDX's technology contributes to a sense of ease while driving. Standard safety features include Vehicle Stability Assist with traction control and a tire pressure monitoring system – quickly becoming customary in most cars. Speed-sensitive volume control helps you keep your hands on the wheel instead of fumbling with dials. The all-wheel drive system mentioned above is a coup for Acura. The advanced technology improves your drive and speaks volumes about Acura's safety systems. Large SUVs aren't generally the Earth's best friends. 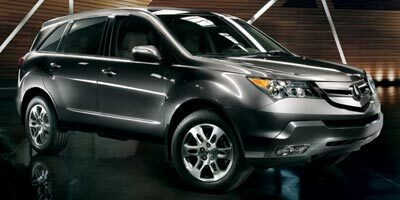 The Acura MDX is no exception to this rule. At 15 mpg city and 20 mpg highway, you'll get to know your neighborhood gas station attendant very well. But, it holds a ULEV-II (Ultra Low Emission Vehicle) emissions rating, which is 50% better than the lowest emissions standard now allowed. A softly alluring instrument panel greets you and your passengers upon entering the car, and the audio and climate controls are easily reached. There are also controls and a power outlet in the rear. The middle row of seats might be a little upright for occupants until the seatback is adjusted; and when folded in their 60/40 split, they don't lie completely flat. Barring the grille, which looks like a surplus piece of medieval armor, the styling of the MDX is appealing to the eye. The rear spoiler hints at the sportiness under the hood and the large front bumper gives the car a harder edge. The roofline is a little high, but that's understandable considering how large the interior is. Priced well in its class at $40,790, the MDX manages to compete well against rivals like the Volvo XC90 ($37,000), the BMW X5 ($46,200) and the Kia Sportage ($21,900). 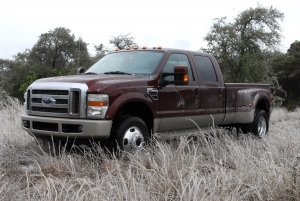 It offers equivalent or better standard features and appeals to the sportier family driver. The Acura MDX is a competitively priced SUV that's capable of carrying a few peewee football team members, all their gear and their chaperone. Its fold down seats and drive versatility make it a wise choice for a capable family luxury SUV.